Raschel Bags are used to pack Vegitables mainly Onion , Potato , Cabbage , Carrot , Oranges , Coconut etc. We manufacture Good Quality Raschel Bags on World Best German machines. We have Latest state of art machinery to produce Good , consistent Quality Defect Free Raschel bags. 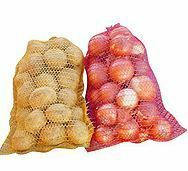 Leno and Raschel Bags are used to pack fruits and vegetables like Orange, Potatoes, Onions and all other vegetables. We are offering Raschel Mesh Bag.